Applicable across diverse areas including: training and education, presentations, research, surveillance, and exhibits. Temporal Innovations' patented FrameGlide software with Spin Browser dial (FG|SB) system allows fluid, interactive exploration of any pre-produced or ongoing live-capture video, forwards and backwards, from stop frame to exponential speeds with no image degradation. Movement through content occurs instantly in response to user control - there is neither temporal “stutter” nor perceptible latency. 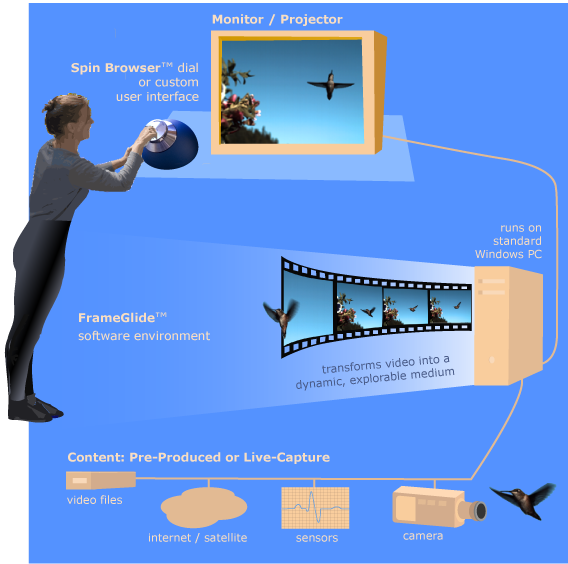 The four core system elements are: the FrameGlide™ software running in a standard Windows environment, Spin Browser™ dial (or other user interface), a source of content (live or pre-produced), and a monitor or projector. Basic systems can be set up in just minutes, and can be as compact and portable as a simple laptop. Our Spin Browser dial is often the preferred user interface, with its fluid feel matching the fluid visual experience. Other interfaces are also readily supported, from simple linear slider to complex custom options. See the FG|SB overview video. Distinctive FrameGlide capabilities include multi-stream HD operation and liquid-smooth review of terabyte-size image files in 100% parallel with ongoing live capture. An FG|SB Features and Advantages document: A detailed feature list (in Appendix B), and testimonials from clients regarding the system's reliability and ruggedness. 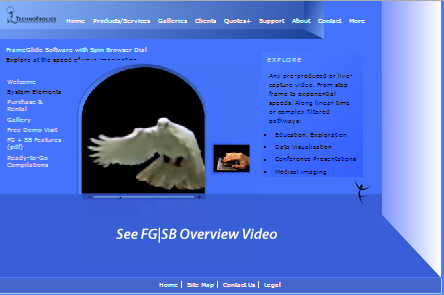 An FG|SB overview video: Views of the system being used to explore content. Applicable in areas where the ability to dynamically 'data mine', sort and filter large stores of video data and swiftly view results is valuable. Get answers (almost) as fast as you can think of the questions. Highlight events and discover patterns within vast stores of video data using image-derived metrics and/or external sensor data. Temporal Innovations' metric-enhanced FG|SB system provides answers in seconds - not hours or weeks. You no longer have to worry about losing weeks due to asking the wrong question - just ask a different one and get the answer in an instant! From weeks of captured video data, observe cloud formations only at negative peaks in the derivative of the barometric pressure, then only at times when the wind speed exceeds 10 knots, and then only when both conditions are true. From days of filmed classroom behavior, view only those times when the accompanying audio volume is 200% greater than the norm, then only the 20 seconds prior to such outbursts, then the 4 minutes following. Remove all stationary sections from a night's worth of human subject sleep video, then re-order the frames from least EEG activity to most. Remove all but the explosive flashes in hours of nighttime ballistic test footage, then highlight only those light bursts with a particular color signature, then interactively adjust the brightness threshold to first eliminate false positives, then false negatives. Within weeks of traffic footage, show only the 5 seconds following stop light transitions from red to green, then the 7 seconds preceding a change from yellow to red, then only during rainy weather. Compare thousands of instances of a robot arm securing a bottle cap, first at the contact point, then 10ms before, then 10ms after, then only just prior to misalignment-caused equipment stoppages, then re-order the frames from least arm vibration to most.